Even though I stay home with the girls, breakfast can be a crazy time. I like to get in some protein and veggies at the beginning of the day though. It helps curb hunger and - let's face it, the green containers are not my favorites (though I have learned to appreciate them more). Last week I whipped this up and I must say, I like everything about it except the use of the microwave. While I believe the microwave robs food of some of its nutrients, this is still a healthier way to get a quick breakfast than a pop-tart or throwing some cereal in a bowl as I may or may not have been known to do in the past. But microwave = quick. Nutrient thievery aside, this is easy to clean up (you can do it in one bowl) ... you can knock out a red, a green, and 1/2 blue first thing in the morning so it is packed with nutrition ... and I found it to be surprising delicious! 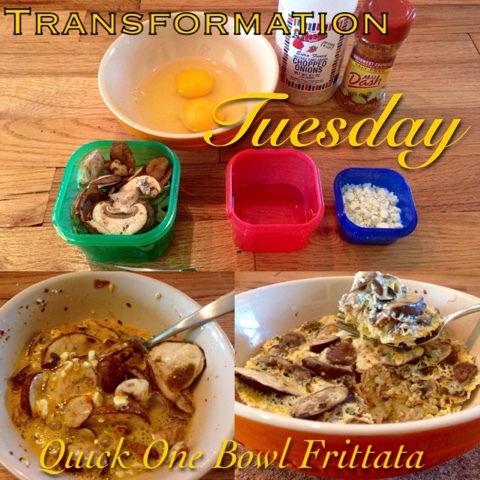 "Chef Amanda" presents the Quick One Bowl Frittata. Crack your eggs into the bowl and scramble them (I wish I had done this that first time, it was hard to scramble after everything was together in the bowl). Add seasoning and dehydrated onions and scramble a bit more to disperse evenly. Add cheese. Scramble again to distribute. Add veggies and stir until they are coated. Cover with plastic wrap (it makes a nice steamy bubble and keeps anything from getting completely nuked dry). Microwave for ~2 minutes and check for done news by poking a fork or knife into the center. Keep adding time by 10-15 seconds until it comes out clean. (It took me 2.5 minutes total). Enjoy! I later tried a variation with baby kale and grape tomatoes instead of mushrooms - I should have chopped it up first, but it was still quite tasty if not a little awkward. The possibilities are endless! Yummy!! This looks completely doable! 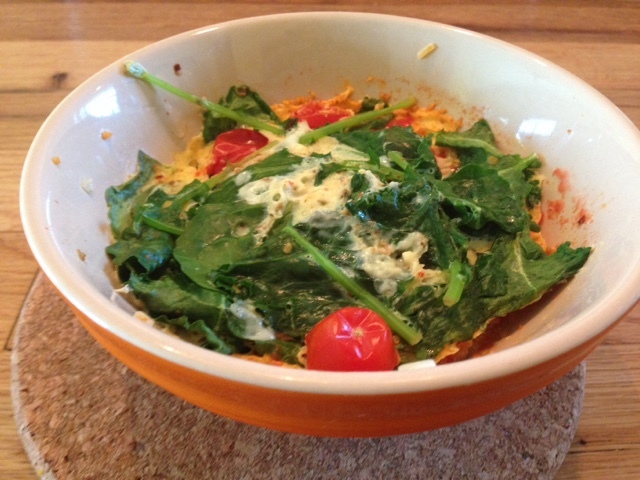 "I used blue cheese. Like it was blue before it was in the blue container ..." - Hilarious! What Shelby Said Wednesday - Do I Look OK? What Shelby Said Wednesday - What Time It Is?